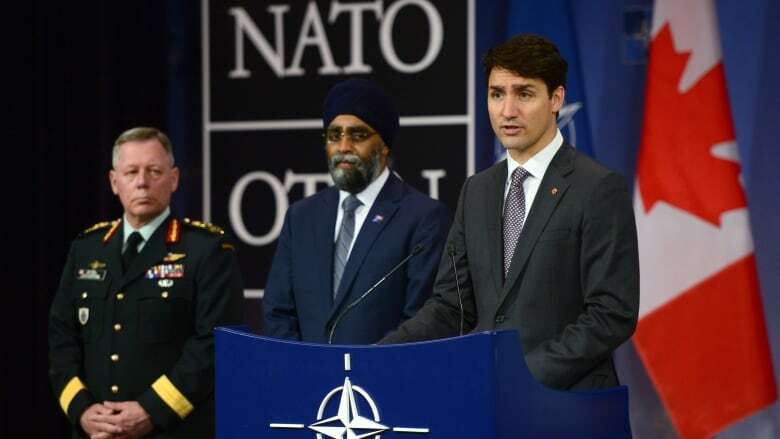 National Defence Minister Harjit Sajjan, centre, and Chief of Defence Staff Gen. Jonathan Vance as Justin Trudeau holds a press conference at NATO headquarters. Second in a four-part series on the 70th anniversary of the North Atlantic Treaty Organization. The first installment in this series discussed how NATO was set up partly to blunt the European Left. The other major factor driving the creation of NATO was a desire to bolster colonial authority and bring the world under a US geopolitical umbrella. In one sense the popular portrayal of NATO as a defensive arrangement was apt. After Europe’s second Great War the colonial powers were economically weak while anti-colonial movements could increasingly garner outside support. The Soviets and Mao’s China, for instance, aided the Vietnamese. Similarly, Egypt supported Algerian nationalists and Angola benefited from highly altruistic Cuban backing. The international balance of forces had swung away from the colonial powers. To maintain their colonies European powers increasingly depended on North American diplomatic and financial assistance. NATO passed numerous resolutions supporting European colonial authority. In the fall of 1951 Pearson responded to moves in Iran and Egypt to weaken British influence by telling Parliament: “The Middle East is strategically far too important to the defence of the North Atlantic area to allow it to become a power vacuum or to pass into unfriendly hands.”The next year Ottawa recognized the colonies of Vietnam, Cambodia and Laos as “associated states” of France, according to an internal report, “to assist a NATO colleague, sorely tried by foreign and domestic problems.” More significantly, Canada gave France hundreds of millions of dollars in military equipment through NATO’s Mutual Assistance Program. These weapons were mostly used to suppress the Vietnamese and Algerian independence movements. In 1953 Pearson told the House: “The assistance we have given to France as a member of the NATO association may have helped her recently in the discharge of some of her obligations in Indo-China.” Similarly, Canadian and US aid was used by the Dutch to maintain their dominance over Indonesia and West Papua New Guinea, by the Belgians in the Congo, Rwanda and Burundi, by the Portuguese in Angola, Mozambique and Guinea-Bissau and by the British in numerous places. Between 1950 and 1958 Ottawa donated a whopping $1,526,956,000 ($8 billion today) in ammunition, fighter jets, military training, etc. to European countries through the NATO Mutual Assistance Program. The role NATO played in North American/European subjugation of the Global South made Asians and Africans wary of the organization. The Nigerian Labour Party’s 1964 pamphlet The NATO Conspiracy in Africa documents that organization’s military involvement on the continent from bases to naval agreements. In 1956 NATO established a Committee for Africa and in June 1959 NATO’s North Atlantic Council, the organization’s main political decision-making body, warned that the communists would take advantage of African independence to the detriment of Western political and economic interests. 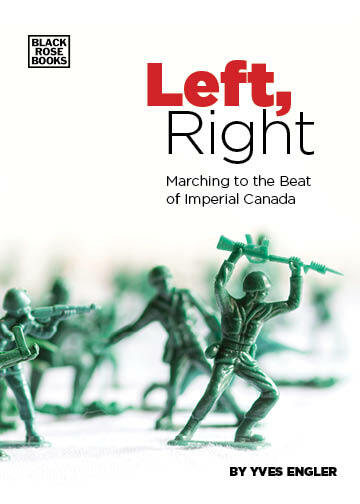 A growing capitalist power, Canada was well placed to benefit from US-centered multilateral imperialism. The Canadian elite’s business, cultural, familial and racial ties with their US counterparts meant their position and profits were likely to expand alongside Washington’s global position. NATO bolstered colonial authority and helped bring the world under the US geopolitical umbrella, from which the Canadian elite hoped to benefit.